I’ve spent the last few months behind the scenes with Judy and Mimi to prepare for the launch of beautybagg. It’s about time that I introduce myself. I’m a twenty-four year old Asian American. I have medium combination skin that’s sensitive and occasionally still grapples with acne. I have thick, long, and wavy hair that I usually flat-iron straight or curly, which means I also get the occasional split end. I had a bit of a Spartan upbringing when it came to beauty. As the oldest daughter and a mother who didn’t wear much makeup, my idea of beauty growing up was a few swipes of eyeshadow paired with a fruity lipgloss. It wasn’t until I got to college that I started to wear makeup daily and take better care of my skin. By then, the floodgates had opened, and I was subscribed to dozens of beauty blogs and YouTube channels, mildly obsessed. Bloggers were like industry celebrities in my mind. If they made cardboard cutouts of themselves, I probably would’ve had one. 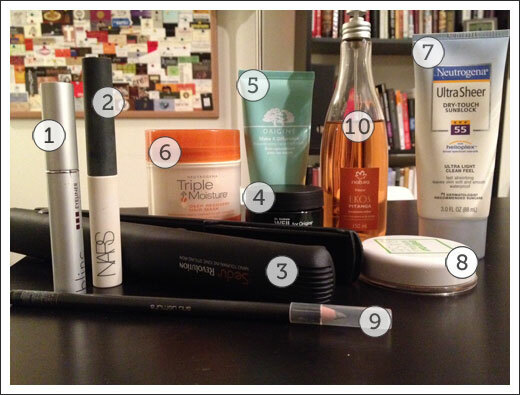 I’ve picked up a few tips and tricks of my own since then, and I’d like to share with you my 10 Holy Grail products. Most of these products were recommended to me by my friends, some were haphazard purchases, and others were the result of years of painstaking trial and error. 1. Blinc eyeliner. I was very skeptical at first. Smudge-free? That sounded too good to be true. But after four years of being loyal to my MAC Fluidline, I decided to give Blinc a try. Blinc applies cleanly like liquid eyeliner but then hardens into a layer of color that you can neatly peel off. But until then, it doesn’t budge. Hallelujah. 2. NARS Smudge Proof Eyeshadow Base. Here we go again with the lofty claims of smudgeproofness. While no promises of permanent makeup, this one still works. I may or may not have conducted some scientific research on this, and days when I go without it are sure to be eyeshadow crease days. I switched to this from Urban Decay Primer Potion, which kind of works but never sealed the deal for me like NARS did. 3. Sedu flat iron. This beauty has spoiled me to the point that I can rarely ever leave the apartment without styling with it. I’ve used CHI, T3 SinglePass, and Solia in the past, but Sedu just blows the rest out of the water. It’s by far the best in terms of plate smoothness and reliability. It’s on the pricier end at $160, but Folica will give you $40 for recycling your old flat iron. Genius! 4. Origins Dr. Weil Plantidote line. This is an oldie but a goodie. It calms and softens my sensitive skin, and it comes in both cream and lotion forms so I don’t need to change moisturizers with the season. I’ve used this for several years now, and when it works, you just don’t want to mess with it. 5. Origins Make A Difference Hand Treatment. You can tell I’m a big fan of Origins. This is such a simple but lovely product. It’s the perfect texture, smells glorious, and performs miniature miracles on my hands. Protect your hands, ladies. It doesn’t matter how much Botox you inject if your hands age faster than you. 6. Neutrogena Triple Moisture Deep Recovery Mask. This one truly surprised me, since I didn’t expect Neutrogena to put together a good hair product (I was more familiar with their skincare line). However, I’ve had my share of flings with fancy brands like Moroccan Oil, Phyto, Fekkai… and somehow I come back to this every time. It turns my otherwise dry, over-styled, limp hair into silky, bouncy waves that feel heavenly. 7. Neutrogena Ultra Sheer Dry-Touch Sunblock. Neutrogena is another brand that I love for its versatility and affordability. This sunscreen is simply incredible. It doesn’t smell, it’s not sticky, it won’t clog up your pores, and it comes in a variety of SPF strengths (up to 100!). Basically, you’ve run out of reasons to “forget” to put on sunscreen. 8. Everyday Minerals. I love everything about this company, what they make, and what they stand for. Everything is natural, organic, and – wait for it – affordable. They have an extensive color selection that’s easy to mix, and they offer free samples kits so you match your skin color to a T. I use a single, thin layer over my Laura Mercier tinted moisturizer. 9. Shu Uemura Hard Formula Eyebrow Pencil in Stone Gray. I, like most Asians, have the curse of sparse brows. I rarely come across gray-brown colored pencils. My hair is black, so most browns make my brows look too unnatural. This one by Shu is the perfect color. 10. Natura Ekos Pitanga fragrance. Natura is a popular brand in Brazil, and I picked this up when I was there, but you can also buy it on some websites like Macys (thank you, Google). Pitanga is a fruit native to Brazil that has a very pleasant but difficult to describe scent. Personally, I don’t like to wear popular fragrances, so I picked this for its uniqueness. I get compliments on this every time I use it, and I’ve yet to come across anyone else here in the states with it. Have you tried any of these products? Or do you have a worthy contender? If so, please share!